Brain Age: Train Your Brain In Minutes A Day! (which will henceforth be referred to simply as Brain Age) is set up with non-gamer simplicity in mind. Nintendo realized that several people would buy a Nintendo DS for this game and, since they didn't own one before, they'd need a simple setup for their first pseudo-gaming experience. "Download" is right on the main menu and, instead of buttons saying "Vs Play" and "Demo", they say "Calculation Battle X 30" and "Send Demo" - both of which are more descriptive and accurate. There's not a long opening sequence forced on the player, but there is a forced sequence at the end of any one part of the demo (you can tap through it, but it's still annoying). The download time is quick: 20-25 seconds for the demo and nearly instantaneous for the Vs Play mathematics challenge. The menu system in the game is simple. The menu options are large. The labels are easy to understand, even for newbies (new players). The separations between each of the options are sufficient. Hosts do not need to enter their profile before sending a demo or participating in a vs play battle, further speeding up the process. While there is a Vs Play option and a Demo option, the demo has three sections, so it's like there are four parts of Brain Age to refer to. The Quick Training (in the demo) and the Calculation Battle X 30 (Vs Play) both have the players writing numbers on the touch screen. While not 100% perfect, the number recognition is excellent if you write legibly (remember, the game recognizes handwritten numbers - it's not psychic). Quick Sudoku (in the demo) is similar, but encorporates other controls - zooming, notes, and moving from one square to another. Why you can't quit out of Quick Sudoku without zooming out, I don't know, but the control there is also excellent. The problem comes into play with the Quick Brain Age Check. The voice recognition is nowhere as accurate as the handwriting recognition is. From what I've heard from people, that's been the main complaint by more people than just myself. I don't know if it was intentional by the games programmers or not, but the result is that the game always scores you higher in age. The effect of this can go one of two ways: players may be motivated to buy the game to improve their score or they may get frustrated with the game. More often that not, players get motivated, but it's not 100%. One really nice - and expected - consideration programmed into the game is that there are separate settings for people based on whether they are left- or right-handed (which really is necessary, considering you hold the Nintendo DS system sideways like a book). The look of the game is pretty basic, considering that not much is needed besides letters and number, but there are a few elements of higher-quality graphics. The brain models are multi-colored and are encorporated into descriptive explinations. Then there's the giant, polygonally-constructed, freakily-floating head of Dr. Kawashima (yes, I know I made up a few words there, but it was for descriptive purposes). He smiles, he frowns, he explains things - it's all a little creepy, but it doesn't cross the border into scary (that would only happen if they started describing what happened to the rest of him). The game can be played without the sound, but the chimes and tones to set an atmosphere for the game. Obviously, you're going to need silence for the Quick Brain Age Check. Brain Age includes Vs Play and a three-part Demo, including Sudoku. There are a few other non-math games that are more enjoyable than Calculations X 20 (which is pretty close to what's already available in the Vs Play). The only inaccuracy is that not every training exercise in the game is math-related. Other than that, there're several activities and the game IS representitive of the single-player experience. The Vs Play is the first of any game I've reviewed to be a true 16-player experience. A number of games list up to 16 players on the package, but most of the time, it just means that up to 16 people can download the demo at one time, which is misleading. Brain Age's Calculation Battle X 30 can take up to 16 players at one time. That said, it's only 30 mathematics problems, so it's not very deep. The demo is better, with a sample of the Stroop Test (Quick Brain Age Check), Calculations X 20 (Quick Training), and Quick Sudoku. The Quick Sudoku is only one game, so there's not too much replay value (unless you want to work on your score). Replay value on the Stroop Test can improve your score and Calculations X 20 features different math problems each time. One of the non-math/non-number exercises would have deen nice (Connect Maze, perhaps?) would have been really nice, but what's offered is more in content and accuracy than most games can bother offering. When you own Brain Age, you'll likely play a little (almost) every day, but the demo, while excellent and fun, won't last too long. Allow for players to quit out of Quick Sudoku without zooming out. Encorporate an additional one-on-one (demo-vs-demo allowed) calculation battle into the demo. Improve the voice recognition of Quick Brain Age Check. Include the Connect Maze in the Single-Card Download Demo. Offer one Sudoku puzzle per difficulty level. 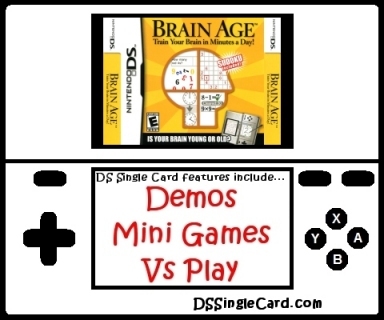 Click here to return to the DSSingleCard.com Brain Age: Train Your Brain In Minutes A Day! profile.